Having dry fitted both the second laminate shereclamps I left them for a couple of weeks to take a set, which although slight, certainly helps the bonding assembly process. Having used up my initial 10kg of SP106 I thought I would try WEST epoxy. It's clear rather than tinged yellow, has a slightly lower viscosity and the cured product is waxy. For component bonding I prefer SP106. But for sheathing I think I will be looking for a more specific product. 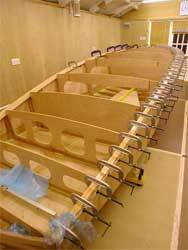 I don't see much more happening this side of the New Year except perhaps dry fitting the cockpit side beams. 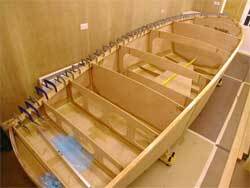 After this and the deck beams are bonded in place it will be time to turn it over and plate the bottom hull panels and then sheath it.